In her little tales Beatrix Potter created a wonderful world inhabited by a variety of charming creatures. The characters have become familiar friends at bed time and their adventures in the British countryside continue to win the hearts of new generations of readers. 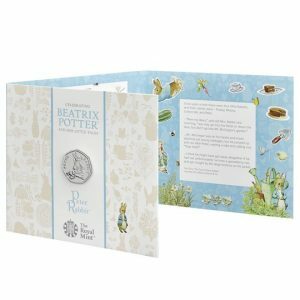 In 2016 The Royal Mint began celebrating the life and work of Beatrix Potter and each year the new coins have been eagerly awaited. Now, Mrs. Tittlemouse is the latest character to join the popular series. 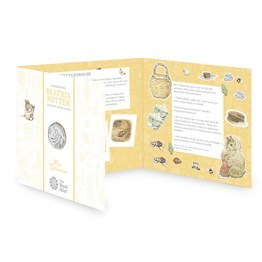 This is the first time Mrs. Tittlemouse has featured on an official UK coin and she takes centre stage. Every tiny detail of Beatrix Potter’s original illustrations of the unlikely heroine has been captured by our Brilliant Uncirculated finish. 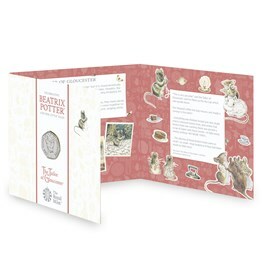 The coin comes in a fold-out case, inspired by Beatrix Potter’s own watercolour illustrations, including more details about the inspiration behind the world of Mrs. Thomasina Tittlemouse.